Nissan engineers eked out another mile-per-gallon efficiency from the midsize Altima and its mild-mannered 4-cylinder engine for 2016. Sleeker styling, including redesigned front and rear fascias for improved drag coefficiency, grille shutters, reduction in internal engine friction and continued taming of the transmission were points of focus in the midcycle product makeover. The improvements raised the EPA highway estimate to 39 miles per gallon for the Altima 2.5. Add a very quiet and comfortable interior to this, and it may explain the fact that the Altima has become the second-best-selling midsize sedan in the country for the first six months of 2016. The Altima is outselling the Ford Fusion and Chevy Malibu, the Hyundai Sonata, and even the Honda Accord. It trails only perennial sales leader Toyota Camry. 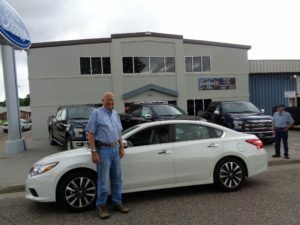 Of concern for many shoppers and eventual buyers of the Altima is its continuously variable transmission, which several years ago replaced its automatic shifters. The gearless, smooth-operating CVT is of much slower and weaker response than the traditional automatics. I would opt for the 270-horsepower, 3.5-liter V-6 engine to move the Altima up to par in power. With the review model’s CVT and 182-hp, 4-cylinder engine, I was rolling along in busy I-25 left-lane travel at 75 miles per hour, when a driver 10 or 12 lengths ahead very briefly broke his car’s speed, then quickly recovered. The chain-braking reached my Altima, but its response after the slowdown was such that I couldn’t catch up with the guy ahead, couldn’t get out of the way of the guy behind and couldn’t move into the just-as-busy right lane. There are times, such as that, when the engine speed is far below that of the throttle position. On a much brighter note, for overall travels the Altima responded with an unusually high 35.9 miles per gallon, peaking through an easy highway drive to Wray. In visiting with sister Norma Wagner and her husband, Dave, recently, she expressed an interest in taking a ride with Jan and me to Wray, our old hometown. We’ve traveled with the Wagners (of Sterling) to Seattle in an Oldsmobile, Santa Fe in a Lincoln, Phoenix in a Ford, Branson in an Acura, Idaho in a BMW, Kansas in an Audi, and, now, Wray in a Nissan. The Altima offers a roomy interior; this one dressed up with a new light finish of wood trim. Adding of sound-deadening insulation and an acoustic laminated glass windshield have quieted the cabin; its Bose premium stereo sound with nine speakers is pleasant. The leather seats are heated in front, along with a heated leather-wrapped steering wheel. A redesigned center stack offers easy access. 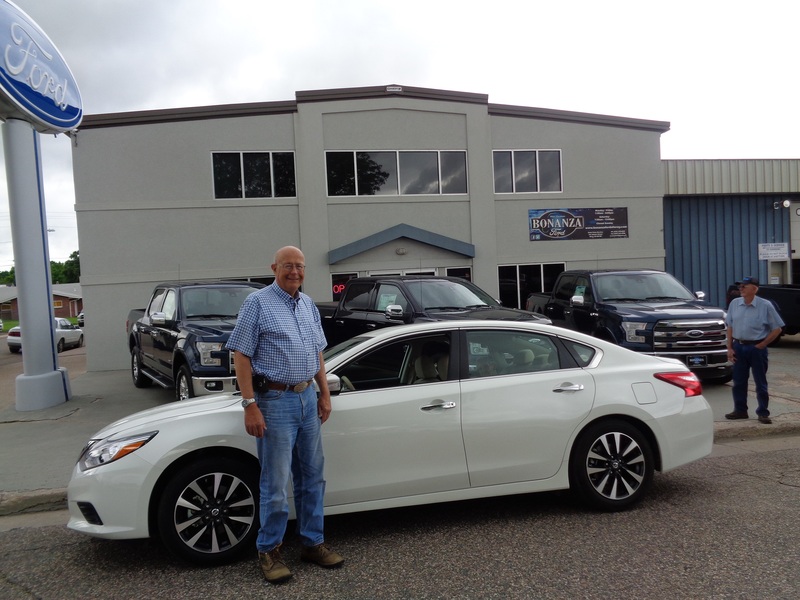 Pushing the Altima’s sticker price to $32,510 was a $1,700 technology package of 7-inch touchscreen color display, NissanConnect with navigation and audio, intelligent cruise control, forward-collision warning and remote start with Smartphone. The Nissan rides on Michelin P215/55R17 tires with machined aluminum-alloy wheels, and is equipped with independent front struts and laterally stiffened rear multilink suspension. The Altima is very closely lined up with the Toyota Camry. Even their trunks are identically sized at 15.4 cubic feet. The Altima has been part of the Japanese-based Nissan line since 1992, when the first one rolled out of the assembly plant at Smyrna, Tenn.